This is a privately owned and maintained website. It is neither endorsed nor approved of by any official of the town of Townshend, Vermont, Windham County, USA or any official of the Townshend, Vermont School District. All information, photos, etc., except for public documents, is copyright and the sole property of the owner of the website. Reproduction of any non-public content is permissible as long as appropriate citations are made as well as a link back to this website. That is all I ask. Be proper, please. 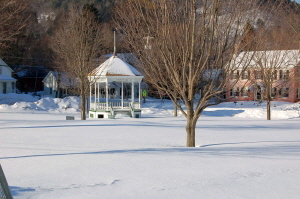 The gazebo in the picture was built for the movie “Funny Farm” in 1988 and the town voted to keep it. A good decision or a bad decision? The verdict is still out on that one. It was a fun movie though. All reasonable attempts are made to ensure the information contained is 100% accurate but there are no guarantees as to the accuracy of the information that has been presented. If necessary, contact appropriate parties / town officials to verify information that is pertinent to you, the user of this site. Note that after Town Meetin’ in any given year, much must be updated so a little understanding is appreciated as the information is gathered and changed. Public documents that are contained within the framework of this site have been gathered by a variety of means. Town officials have been informed that they may request that any information be posted on this website and that will be done as a service to the Town of Townshend and our visitors but they are, in no way, required to do so. External links have been chosen for relevancy and accuracy of information but, again, no guarantees and the owner of this website is not at all responsible for the information presented on those outside sites. Information is added and updated as time allows. Some of us have day jobs that we must tend to first. Suggestions and corrections are always welcome though there are no promises made that your suggestions or corrections will become part of the website. If a link is not working, please report it (“email” under contact). That will be tended to asap. This site uses two statistical providers which use “cookies”. One is Google Analytics and the other is Quantcast. The information collected is not personal in nature. It is just helpful to know what pages are most likely to be viewed as well as “user flow”. Users of this website understand that there is no official connection to the Town Of Townshend, postings are not governed by the VT Open Meetings Law, accuracy is not guaranteed, and that all reasonable attempts will be made to keep things up to date but that the website owner is only human and, sometimes, things just don't happen as planned.